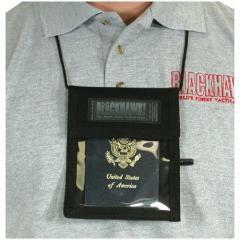 It is made to be worn around your neck or put in a jacket breast pocket for quick access. In has a lid secured with hook & loop. The inside has 2 slip pockets for passport, ID, business cards and/or money. All edges bound with special double needle machines for absolute durability, comfort, and quality. Includes special pen pouch for quick note. The back has a slot to hold business cards. Wt: 3oz.